Gaming principles are being applied all around us these days. We see game-play applied to countless marketing initiatives, we see game-play applied to the exercise industry, we see game-play applied to learning, and we see game-play applied to innovation. Yoxi (prounounced Yo-see) is one of these latter examples that uses gaming principles to spark innovation that will provide a positive impact on our society, such as reinventing fast food. How does Yoxi work? Simple: it applies 2 aspects of human nature that we can’t get enough of – competition and problem-solving. Therefore, teams of problem solvers are pitted against one another and battle to deliver the best solutions to social issues. You vote, comment and play along online. The winning team gets the funding opportunities (between $5000 to $40000) and professional support (through thought leaders and influencers) to make their idea a reality . The more you play, the more points you get, and the more your voice is heard. That way, you play to support great ideas becoming a reality. It is such a great initiative because it truly believes that solving some of the world’s tough problems can be fun, and therefore closer to reality than we think because creativity is more rampant today than arguably in any time in history. Have a visit and make a change that matters! 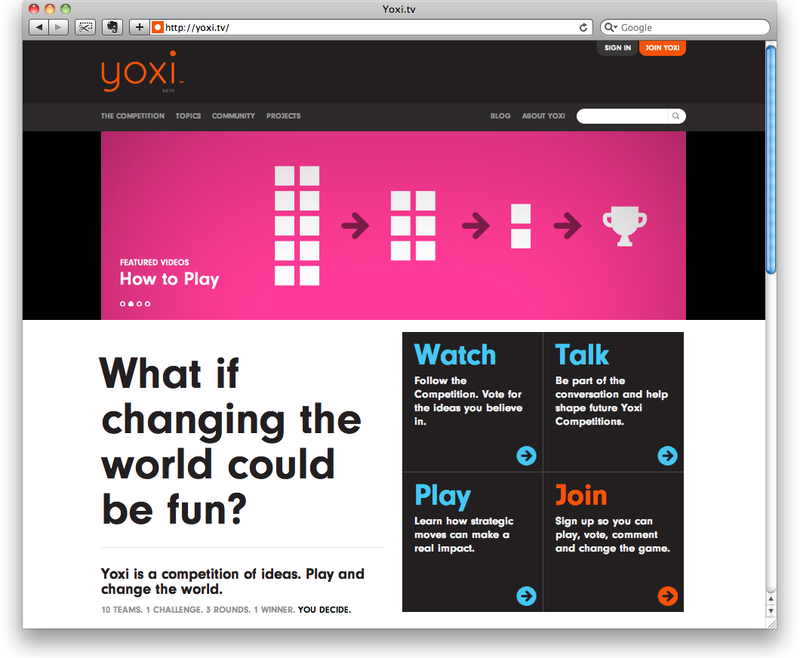 How to Play from Yoxi on Vimeo.